This Female Exercise and Muscle Guide Poster caters specifically to the female form, and is intended for the use of women. Among many of Bruce Algra’s fitness posters, this poster will enhance any home gym or fitness facility. This is one workout chart that has attained global use, as the chart illustrates the specific exercises necessary to shape, strengthen, and tone the isolated muscle groups. 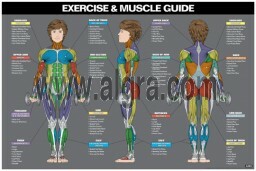 This chart displays the front and back muscular views, differentiating each muscle group with an array of colors.